RESTON, Va. – While liver biopsies are powerful and reliable, they are also invasive, painful, limited and subject to complications. These effects may soon be a thing of the past for some patients thanks to new research showing PET imaging with the 18F-FAC radiotracer can be used as a non-invasive substitute. The study is featured in the October issue of The Journal of Nuclear Medicine. Sometimes immune cells work a little too hard, leading to attacks on our organs, especially in instances of organ transplant. What results is a lifetime reliance on immunosuppressant drugs, which need to be carefully administered to ensure they are working as intended without dangerous side effects. Physicians look for T cells to determine whether an organ is under attack, requiring a biopsy to sample tissues. Now, PET imaging might offer a non-invasive alternative in the case of immune cell attack on the liver. A team of researchers created a preclinical mouse model, testing the use of PET imaging to image T cells in the liver. 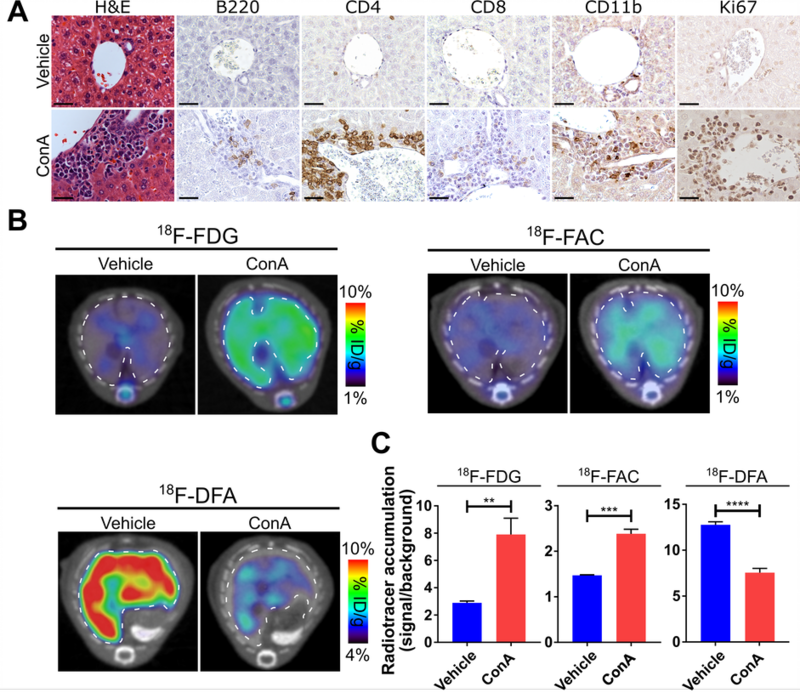 The study shows that PET with the 18F-FAC radiotracer can be used to image T cells as they attack the liver or during treatment with an immunosuppressive drug. The team said they hope this study and others open the possibility of using molecular imaging to diagnose and manage chronic liver diseases as they become increasingly prevalent around the world. FIGURE: Hepatic 18F-FDG, 18F-FAC, and 18F-DFA accumulation are affected in a mouse model of autoimmune hepatitis. (A) Histochemical and immunohistochemical analyses of liver sections from vehicle- and ConA-treated mice. Scale bars represent 50 microns. Transverse PET/CT images (B) and quantification (C) of vehicle- and ConA-treated mice injected with 18F-FDG, 18F-FAC, and 18FDFA. Livers are outlined in a white dotted line. Quantification represents radiotracer accumulation in the liver normalized to a background organ. Authors of “18F-FAC PET Selectively Images Hepatic Infiltrating CD4 and CD8 T Cells in a Mouse Model of Autoimmune Hepatitis” include Jessica Salas, Bao Ying Chen, Alicia Wong, Dongui Cheng, Owen Witte and Peter Clark, University of California, Los Angeles, and John Van Aram, University of Pennsylvania, Philadelphia. Please visit the SNMMI Media Center to view the PDF of the study, including images, and more information about molecular imaging and personalized medicine. To schedule an interview with the researchers, please contact Sarah Schlieder at (703) 652-6773 or sschlieder@snmmi.org. Current and past issues of The Journal of Nuclear Medicine can be found online at http://jnm.snmjournals.org.